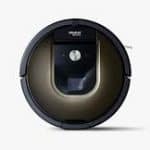 Looking to buy a robot vacuum? I have seen these gadgets around for a while now. A couple of robot vacuum cleaners have popped there heads out in my customer’s houses, As well as seeing them featured on gadget tv shows. Wouldnt it be fantastic if they actually worked? Imagine coming in from a hard days graft and the floors in your home were all dust and fluff-free. So I thought I would grab a hold of one of these gizmos and see if they held up. First things first we need to download an App and get the vac hooked up to the internet in the house it’s set to conquer. 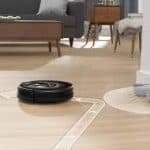 Once the Roomba sets off, it adjusts its height settings so as to get the best result on hard floors or carpeting. It does bump into things (just gently) as it maps its route throughout the home. The battery will last up to 2 hours, although its bin will need emptying by an actual human being fairly often. Two laser beacons are the vacuums eyes, and it finds its way around rather well. It is a bit odd when it pops into one room, has a look, and then returns a few minutes later. Suction is good for such a small and compact device, but of course not close to a twin motor upright vac. If you have pets then this may not be the best choice for the version I tried didn’t like picking dog hair up so much. Another disadvantage is the vacuums inability to climb over any kind of cable (such as lamps etc), plus it cannot take care of upholstery. So in conclusion – if you are a little lazy when it comes to carpet cleaning, don’t have pets or an especially messy house, it may be worth a punt. But at £889 it’s a bit expensive.